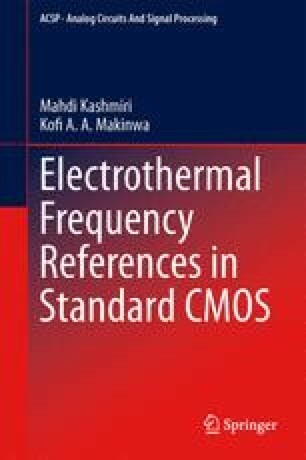 This chapter describes the design and implementation of an electrothermal (thermal-diffusivity-based) frequency reference in standard 0.7 μm CMOS. The reference locks the output frequency of a variable oscillator using a frequency-locked loop to the process-insensitive phase shift of an electrothermal filter. This is in turn a function of the thermal-diffusivity of silicon, which is temperature dependent. Therefore, the loop needs to be temperature-compensated. To do this, the digital output of an on-chip band-gap temperature sensor is applied to the digitally-assisted frequency-locked loop that was described in the previous chapter. The result is a frequency reference in a 0.7 μm standard CMOS whose output frequency is stable to within ±0.1% over the military temperature range (-55°C to 125°C).